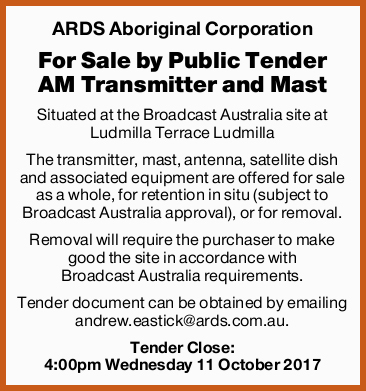 Following the transition of the Yolngu Radio broadcast in Darwin from AM to FM in July 2017, ARDS Aboriginal Corporation is offering the AM Transmitter and Mast for sale as a ‘going concern’ and as a ‘job lot’. The transmitter and mast are located at a Broadcast Australia site. While the transmitter and mast are available to be relocated, Broadcast Australia has indicated the transmitter and mast can remain at the site on the same terms and conditions that have applied to ARDS.